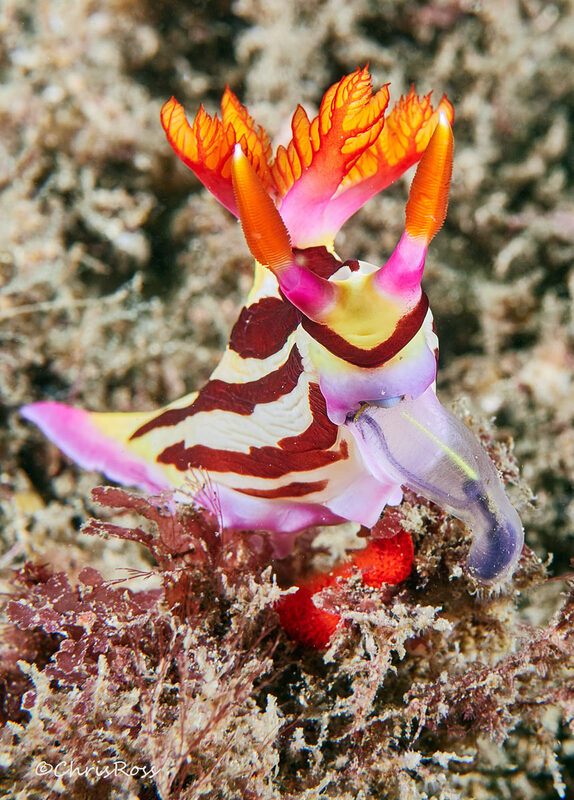 This Nembrotha purpureolineata nudibranch is chowing down on it's prey, the yellow lined ascidian, a type of sea squirt that is quite commonly seen around Sydney. It has everted its oral tube into the cavity of the sea squirt to get at the best bits. There were three of these in a small area on the dive at site called the steps at the entrance to Sydney's Botany Bay. Olympus OM-D Em-1 MkII + Panasonic 30mm macro, Nauticam housing, INON strobes. The colors are gorgeous, beautiful details. Incredibly cool image; even more so given your description, which sounds ugly but is contrasted by the undeniable beauty of this frame. Last edited by Paul Rossi on Thu Mar 14, 2019 8:57 am, edited 1 time in total. What a colorful critter! Love the way you framed it, and the description. You really give us insight into this mysterious world with you beautiful captures. Nudies rule! A beauty, Chris.